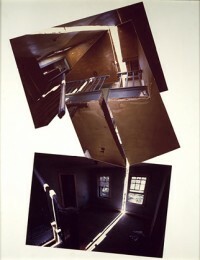 Gordon Matta-Clark was born in New York on June 22, 1943 and grew up in New York, Paris, and Chile. He studied architecture at Cornell University, where he met Robert Smithson and Dennis Oppenheim; however, he did not practice as a conventional architect. In the 1970s, he helped organize 112 Greene Street, an exhibition space showing new art. He also collaborated on Food, a combined restaurant and performance piece; made Garbage Wall, a prototype shelter for the homeless; and was active in building SoHo as an artists' community. He addressed popular culture in the 1973 Photoglyphs, hand-colored black-and-white photographs depicting New York's burgeoning graffiti. 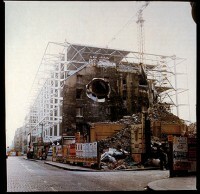 Matta-Clark is best known for his 'anarchitecture' of the 1970s, which were temporary works created by sawing or carving out sections of abandoned buildings and then documented in photography or film. 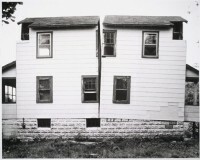 One of the most famous examples is his 1974 piece, Splitting, in which a wooden house in Englewood, New Jersey was sliced through. Matta-Clark passed away from cancer on August 27, 1978. 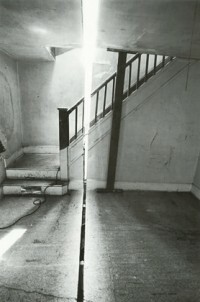 The original Sauna, located in an apartment on East 4th Street and featured in the film Sauna View, was Matta-Clark's first cut work. 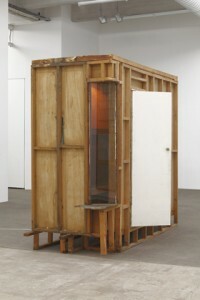 After Matta-Clark moved out, this sauna was removed by Alexander Schröder, the founder of Galerie Neu, which represents Tom Burr, Ull Hohn, Hilary Lloyd, and Josephine Pryde.